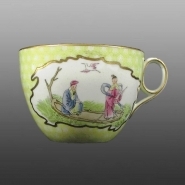 Teacup showing the third Chinese-style scene. Bone china cup and saucer with printed and painted decoration. The pattern number 565 is painted on the base and the design comprises a yellow cellular ground with reserve panels printed with Chinese style figures. On the saucer there is a central circular design of a floral spray, on the rim there are two prints depicting figures in garden landscapes. The cup has an additional scene which depicts a man seated on a boat being powered by a woman.